S T Y L I S H . M: Equestrian Hijabi: The Hardest Request Yet! "I've been horse crazy for 17 years and it tears me apart to think I can't ride anymore because of the Muslimah dress code. 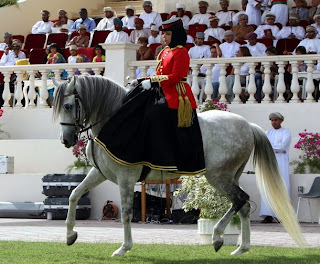 I heard of a version of the olympics, but for Muslims, and they have equestrian events. There is some kind of special outfit the women wear, but the picture was not very good so I couldn't really get a clear look at it - I can't even remember how I found the picture to begin with. 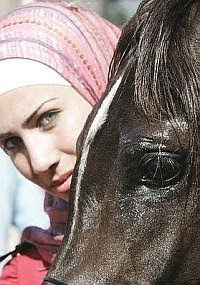 There is virtually nothing online about Muslimahs riding horses." 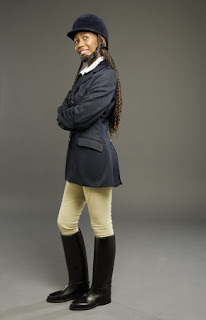 So, I decided to put together a few outfits myself, inspired by the current equestrian uniforms worn by women. wouldn't horse riding get in the way of your schooling? I'm a bit confused, to be honest. 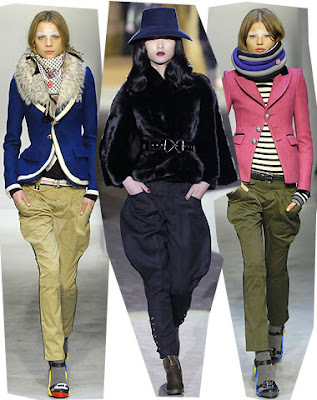 If a hijabi is willing to wear pants there should be no problem ... any sturdy, wide-legged trousers would do fine. 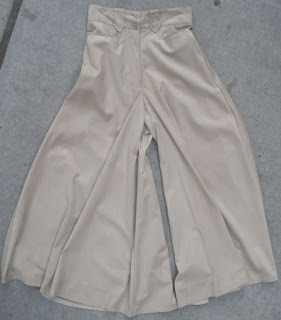 The trouser skirts in Shukr's current catalog are, essentially, modern old-fashioned riding skirts for that matter. The only conflict with riding I can imagine is if one disagrees with wearing trousers in the first place ... in which case side saddles may be a bit obscure, but they are not entirely impossible to find. M.Landers: Yes I see your point about wearing jeans in lessons but the breeches that they wear are skin tight so I was trying to find an alternative to those. So called "Indonesian Prince": No it wouldn't. And I have clearly stated that this blog is for females several times. we are not making physical contact and i haven't cause any trouble. I would say i've been very supportive, so why can't I stay? Hi, thanks for doing this! I started my own blog a couple days ago. It might not be a very busy blog, but at least I'm putting something up for people like me to find. Most lesson barns I have been to are essentially full of women, but there is a smattering of male riders, some male riding teachers, and male support staff. And they should be busy enough that they don't have energy to be looking at the riding pants. I found the picture I was looking for, unfortunately I am now thinking I was mistaken about it being the special horse-riding chador I read about. It was in the same search results, and on the first page, but that doesn't mean they are related. My husband said something about ladies only riding barns in the middle east, but I havn't been able to find a sign of such a thing anywhere in the world from my internet searches. This is great! Though I usually wear knee length tops with trousers but I'm sure I could get something to work with the ideas here. I stopped riding soon after starting to wear hijab (not necessarily connected but I did feel a bit silly) and really want to get back in it, once I can afford it again! In my local tack shop they sell looser, baggy breeches which are slim up the calf (inside the boot) and loose fitting above so yeah idk if they would be suitable. unfortunately i can't remember the brand sorry! I can't believe that there are other muslim hijabis that ride. I have been riding for the past 12 years and I compete in dressgae and eventing. I have gotten by with using the friginni sports wear, but the problem is that it unches up when you get in the saddle and shows some thigh. I would love an alternative thats longer.